“Come in! And know me better, man!” For now, it is the time to learn about cask strength whisky! Definition of cask strength: when a producer has not diluted the whisky after maturation. Over the second weekend of November, Lady of the Glen was showcased simultaneously at the Glasgow Whisky Festival and at the Aschaffenburg Whisky festival; two thoroughly enjoyable events. Part of the delight of attending these festivals are the questions that visitors ask us. Here are two questions that are both linked to our main theme today of cask strength. “This can't be cask strength, it's too low, it's 43.2% ABV” This was in reference to the Girvan vintage 1991 (which is now sold out). Port Charlotte 64.9% ABV I also had someone recently pontificate why I hadn't kept a whisky longer in the cask and this can also be answered by understanding cask strength and bottling. Bottling at cask strength doesn't make a whole lot of business sense. If you were to bottle a cask and then reduce it's ABV (alcohol by volume) down to say 46% or even 43% by adding water you could increase the yield of the cask. This would allow you to sell more bottles and with that increase the profit overall, the customer would get a cheaper bottle too because they would save money on the duty tax! However, in independent bottling there is a desire for transparency and authenticity; people want to taste the cask in all of its undiluted glory, in its most natural state. By contrast, adding water prior to maturation doesn't impact the definition at all. In fact, most of Scotland's distilleries reduce their new spirit by adding water prior to filling them into casks and right after they have been distilled. All the distillery's casks will be filled to the same strength because if it's too high it can damage the oak and they can fill more casks by reducing alcohol while increasing the bulk spirit. Interestingly if you fill a cask at a relatively high strength, based on experience, it retains a higher strength in comparison to filling at a lower strength which lowers quicker. The wood will also have an impact, so smaller sized casks increase evaporation and the ABV drops quicker. While cooler climates, such as Scotland's, cause ABV to drop more slowly. In answer to the question “64.9% ABV for a 16-year-old whisky seems a bit too high!”, this is because some distilleries fill their casks at 71-73%. When this Port Charlotte was distilled, Bruichladdich filled at roughly 71%-73% - big thanks to Jim McEwan! In response to “This can't be cask strength, it's too low, it's 43.2% ABV” - it is still cask strength! Even though Wikipedia can dismissively say that cask strength is typically in the range of 58-66% this is not a fair, accurate or true; cask strength is what the strength is after the spirit has left the oak cask and goes into the glass bottle, no matter how low it is. In this particular case, the reason that the ABV was low was because the whisky was 26 years old! In conjunction with this, the majority of the cask had already been bottled for another purpose, so another reason ABV drops is when there is only a small amount of spirit in the cask or the cask is only half full, the ABV drops quicker. This, in turn, answers the last question “why hadn't I (Lady of the Glen) kept a whisky longer in the cask?” So as the cask was already half empty and at 43.2% that means the spirit can be unpredictable and drop below 40% sharply. If the spirit drops below 40%, it's like a trap door, it cannot be called whisky any more so the value of it practically disappears. Another interesting note of experience in regards bottling of older spirit is that it can be very vulnerable. Actual bottling of low ABV spirit can be dangerous as it can sometimes drop below 40% during bottling, as I found out with a 1963 Carsebridge. In regard to the 43.2% whisky, I bottled it because I liked it and I thought it tasted good. If I didn’t bottle it, I could have sold it for blending. The vulnerability of older spirit can be best illustrated through the testing of ABV. When a warehouse reads the ABV for a whisky they will read the 'apparent' ABV using a little machine in the warehouse. While a scientific assessment of ABV will read 'actual' ABV – most of the time with older whiskies, or whiskies that have used colouring, these are different as the scientific assessment measures through spirit thickness and solids in the spirit. Where there are differences, the warehouse will take a scientific assessment as it will be necessary for the export documents. This is another reason why independent bottlers don't fiddle about with colouring and cask strength because the scientific assessments are somewhat pricey! 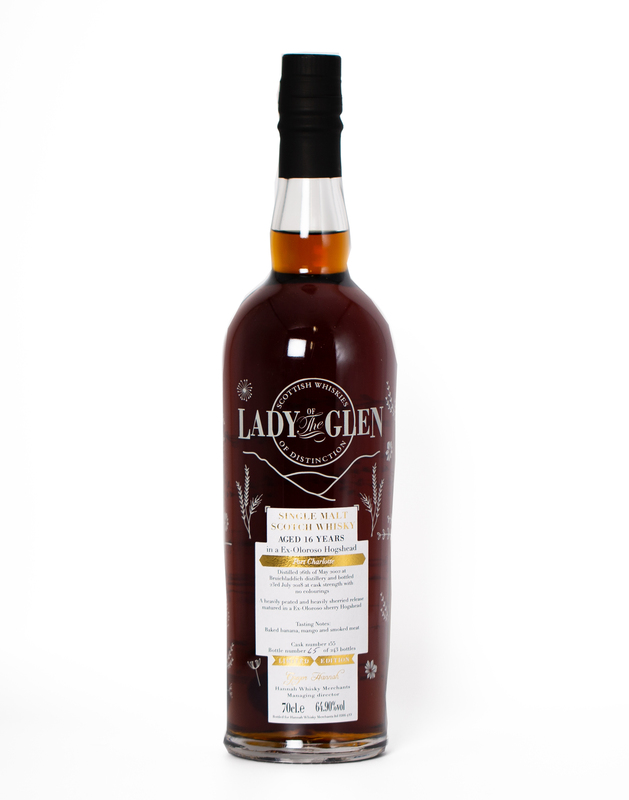 To view all the Lady of the Glen cask strength whiskies check out the shop to find out about the flavours and what you can expect to taste from each bottle of whisky.